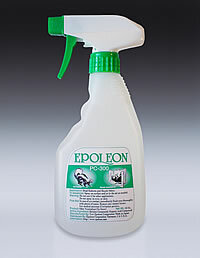 Remove skunk odor, dead animal odor, pet odor, and dead rodent odor with EPOLEON Odor Control Neutralizer! The PC-300 skunk odor control neutralizer was developed mainly for skunk odor control. However, it reacts not only with skunk odor and dead animal odor but also reacts with pet urine odor, mildew odors, sweat odors, tobacco odors that are imbedded in carpets and upholstery. Also, It reacts with raw garbage for indoor and out door applications as well. EPOLEON PC-300 odor control neutralizer dissolves and neutralizes toxic and poisonous gases which include acidic odors (Hydrogen Sulfide, Methyl Mercaptan) and alkali odors (Ammonia, Trim ethylamine) at the same time.